Snowmobiling at dusk, on our way to Tar Inlet. Flying into Iqaluit over Frobisher Bay. Drove into Apex yesterday and saw this wicked construction van. It was parked outside of a #habitatforhumanity project; affordable housing is a major issue in Nunavut, so projects like the home this super cool van drove in for are incredibly important. Early morning Iqaluit looks like a watercolour painting. That being said, there is one way to curb my hesitation, and that’s apps. Apps are what make the smartphone smart, and fun, and really, really useful. The following are my suggestions for Iqaluit-centric apps that will have us tapping and swiping from the airport to Apex. Iqaluit has street names, but no one uses them to tell you where they live or work. Instead, we use what we call building numbers: every single building in Iqaluit has a unique number, starting in the 100s and going into the 5000s. In some of the newer subdivisions, the number system progresses logically (example: 5160 is next to 5162 and across from 5161); however, in some parts of town, the numbers don’t line up (example: 153 is across from 331 and next to 329; 493 is next to 1673) and the 4000s and the 5000s are on opposite sides of town (see City of Iqaluit: Building Numbers). Confusing? Yes. Now imagine an app where you can enter a building number and the corresponding building will be highlighted on a map, with suggested driving or walking directions from your current location. Google Maps has Iqaluit Street View, but it doesn’t have that! 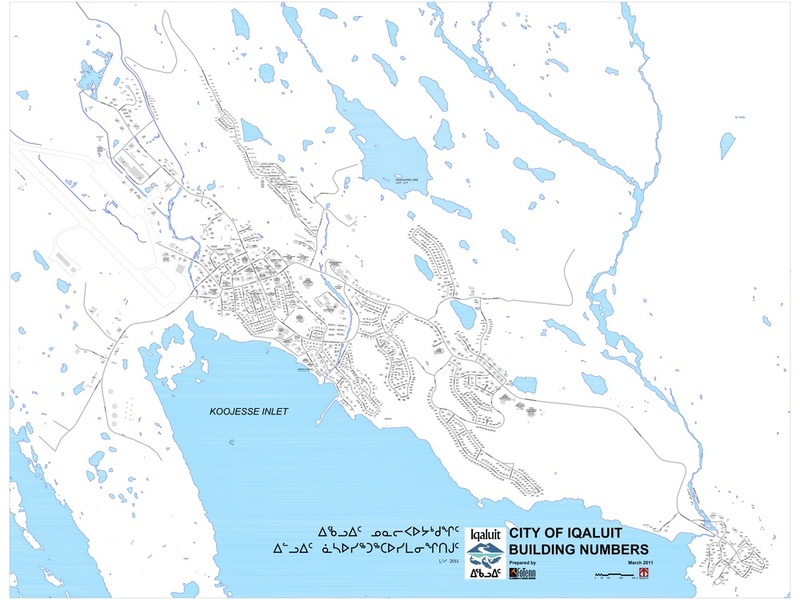 Building Numbers Map from the City of Iqaluit. Squint to locate. General: People are being let in based on their position in line; non-members require a sign-in. Members Only: Only those carrying Legion memberships will be allowed in; non-members have to watch members file ahead of them until the Legion reenters General mode. Full House: The Legion is at capacity; no one is getting in unless patrons on the inside leave. In any of the above scenarios, you can imagine that waiting in line to get into the Legion at -39 degrees Centigrade is the worst. The Legion Lineup Lookout app will let you plan your night according to the Legion’s current status (General, Members Only, or Full House), helping you avoid the world’s coldest club queue. Optional: Members can get an in-app, electronic version of their Legion Membership Card to ensure you never fail to bring proof of your allegiance. This app can be expanded to include updates on the lineup for Wednesday Wing Night at the Storehouse or the post office. In Inuktitut, Taxitaqaqqa means “Is there a taxi?” Similar to other taxi apps like UBER, Taxitaqaqqa will let you locate and beckon the nearest taxi via an in-app map. However, just like the Legion, taxis are different in Iqaluit. They function kind of like carpools, meaning, you may not be the only person in your cab, and your cabbie may make a few pickups or drop-offs on the way to your destination. Taking this into account, Taxitaqaqqa will not only show you which taxi is closest to you, but it will also let you know how many people are in that car. So, if you are with two companions or a giant suitcase, you can choose to call on a cab with few or no existing passengers. Flights in the north tend to go awry, and northern travellers are used to delays or cancellations caused by any number of meteorological or mechanical issues. That’s why the Arctic Airlines App will be so helpful for us, at least when we’re travelling into or out of Iqaluit. The Arctic Airlines app can streamline the flight tracking process by including flight information for all the major airlines that service Nunavut. App users will also be privy to early notification for seat sales or contests, and can enjoy the convenience of in-app purchases for tickets or upgrades. Optional: Airlines can offer app users special promotions; show your app and get an extra cookie! A Nunavut version of the classic Angry Birds, starring the very large, very cunning, and very common raven. Instead of launching angry birds at pigs, in the Tulugait Ninngaumajut (Angry Ravens, in Inuktitut) version, you will send your ravens into the dump to knock over garbage and find food, or at a group of sled dogs on the sea ice so you can steal their seal meat. Other levels can include the top of Iqaluit's tallest building (eight stories high, aptly nicknamed "the 8-storey"), the igloo church, and the Road to Nowhere. Ravens at the dump in #Iqaluit. Can you imagine living without a smartphone? Or do you have any suggestions for apps that would make life in Nunavut that much easier? Let us know in the comments, tweet at us, or check us out on Instagram!